Good Monday morning to you, Elmo. Hope you had a good weekend. It was nice to meet you. JanetMS - don't know why I had such trouble trying to log onto the site to post under my own id!!! 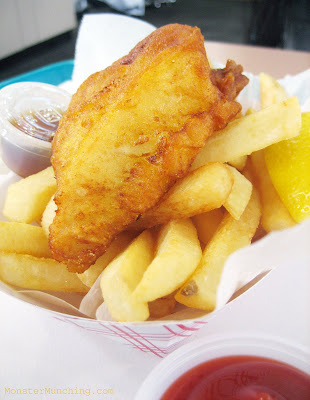 I just ate at a place on Michelson so it's good to see there's a good fish and chips place not far from here. Looks Great, I've been longing for just such a place. Thanks for the tip. Fish and chips are one of my favorite, favorite things and so rarely done right, in my opinion. I've only ever loved them on the beach in San Diego, Monterey or San Francisco. But I know where that food court is on Michelson, I used to work right there. I'll give this place a shot. Simply beautiful!!! That crust looks divine and the fish looks fresh :). I need to get some good fish and chips someday. I've only had them at restaurants and once at Hearst Castle. Need to try this soon! Demmit MM...My list of places to visit grows evermore.. I love fish n chips.. Too bad the H. Salt Fish & Chips near my work is too greasy for my arteries. MM, just read your post on Wako Honey Pig. You should try their other side. They serve cutlet w/ the same pork (and also other cutlet dishes). The cutlet sauce, you grind your own sesame seeds and they pour the sauce right into the grinder, giving it a unique flavor. Meaty, fresh cod, in a well-seasoned batter, fried to a crunchy perfection. A small, charming place, with great sidewalk seating on wooden chairs and benches. Paste this into a notepad file and store in the London folders on your C: drives for future reference. As Elmo notes, all of the characteristics above...i.e. the fish quality, batter, and frying...are important. It ain't rocket science, but since so many places miss the mark, it's nice to know there's a good outpost over in that section of Irvine by the airport where you are surrounded by towering office buildings, yet can hear a pin drop. I actually went to try it just now. Arrived at 6:23pm and they were closed. Should've guessed that based on the area they're in. 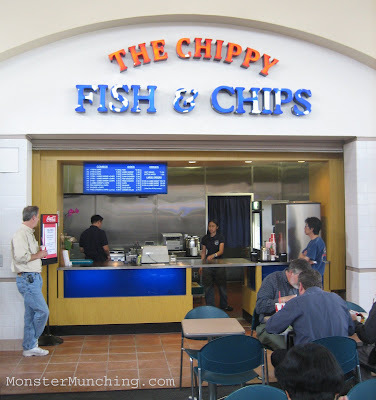 My husband eats at the Thai place in this food court a lot (and I do now), The Chippy is solid, we enjoy it. The hush puppies are really good too! Ooh, lovely fish and chips. How big was that piece of fish? Looks kinda small in the picture, but it looks reallllly tasty! That's pretty cheap! When I was in London years ago, I ate fish and chips everyday, and even back then they were about 7 US dollars a serving. Wow, this is just flat-out frustrating. Just went again, this time arriving at 5:42pm and they were completely closed down once again, even though they say they close at 6:30pm. Maybe their hours are based on Greenwich Mean Time. That blows. Boooo! on closing early. I was planning to make this a dinnertime meal sometime too. Hope they realize soon that people out there also want to eat fish and chips for supper! I don't know what I would do without you and Gustavo. Seriously. And to everyone who might be reading this: I did not pay Andi to say that! I just tried this place for lunch and it was yummy. Thanks for the tip on the Chippy. Great find! But hey Elmomonster, how about a behind-the-scenes blog of Monster Munching? Like, how do you go about finding places; does anyone ever know you're a food blogger; how often do you eat out; how much dinero do you spend on eating a week, etc., etc. Just a suggestion because I'm always so curious! Oh wow...Fish & Chips in Irvine. What a concept! Thanks! 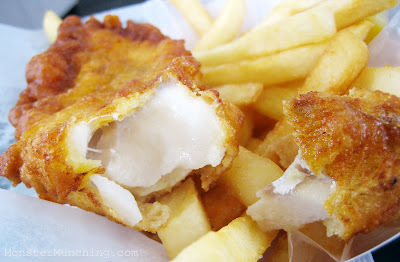 I've never been a huge fish and chips fan until I had the most amazing Barramundi Fish & Chips in Australia a while back. But I've never been able to find anything remotely close in OC. Can't wait! Truly the best and cheapest fish and chips in Irvine. Though, of course, I would love to be proven wrong! That's a great tip! I hadn't even heard of it before. Thanks! At the very least, it's seems very very affordable! I'm probably going to try it soon. AH! Well that's flattering! But I can tell you with all honesty: there's not much going on behind the scenes! I'm just a normal guy who goes out to eat, takes pictures of his food, then writes about it. I say "normal" with my tongue firmly planted in my cheek, of course. Q: How do you get such decent shots with such a cheap camera? A: Hey, wait a minute! Oh nevermind. Who am I kidding. It is cheap. But here's a trick that usually works: I take lots of shots. For every shot you see published there are usually 5 others that I discard. I call it insurance. For color correction and etc., PhotoShop. I use a GorillaPod to shoot in low light. Q: Do people, especially those working at restaurants, know that you're a food blogger? A: Not usually. Or they just don't care. Most are busy trying to keep up with orders to wonder why some schmuck is taking pictures of his food. Plus, now with so many bloggers and Yelpers out there, I blend! Q: How much money do you spend on food a week? A: Not much more than any other person. I'm no Daddy Warbucks, although it might appear that way because I write about a new restaurant every week. But I admit, I'd probably spend less and cook more if I weren't doing this little hobby...not to mention, I would be thinner. Q: Why do you have so many positive reviews? You don't seem to hate anything! A: That's a conscious decision on my part. I'd rather not tear down some hard-working restauranteurs' life-long dream just for shits-and-giggles. I'd rather spend my time on my once-a-week soap box talking about a place I like. And I believe in karma. That said, I did write a little rant about Tao Asian Bistro at the Venetian. Sometimes, even I need to vent. So far Christian loves it, and he's been to chippies in Ireland (having lived there). And I loved it, and I've been to Christchurch. Now if you end up liking it, that will add Australia to the list. I'm waiting for my friend Lesley McCave to issue her verdict. She's is a Briton. Just have to add a bit about the food blogger thing. On my own blog I have made a purposeful attempt to adopt a generally positive tone. Some people have this idea that food bloggers are out to destroy restaurant businesses by writing a scathing review about some little thing you found wrong at their place but I believe too that most people are trying their best to provide a valuable service, and one that their livelihood depends on as well. Yes, restaurants make mistakes but they shouldn't have one mistake of theirs allowed to fester on the Internet forever. I, too, have had people ask me, "Don't you ever write anything negative about a restaurant?" Well, I have a few times but I have found, based on their comments, that visitors tend to mask out all the positive and hone in on the negative. Once I noticed that happening I became more sensitive to how I worded negative things and now try to do it in such a way that visitors don't think I'm recommending that they don't visit the restaurant in question. For one review I mentioned that my first visit was bad but that the next two were great. A visitor read my review and commented, "Now I know I should never ever go to that place," which was not what I was intending to convey. My main tactic for dealing with a place I don't like anything about is to simply not mention them. Good catch Elmo... Will try this one the coming week, shame it's in the Food court that has no Sat opening hours. Having been born in England and lived here (So Cal) and there on and off for work over the last 12 years Fish and Chips is the one thing you miss - you always try to go to the chippy whenever back. I have found H.Salt in Orange (Tustin Ave) the closest to be a true greasy chippy - Proper way that they cook it in England - even have the hot holding bin like a lot of chippy's in England. Let's see how these guys are. BTW: A lot of Chippy's in England used to be Greek owned but a lot are now Chinese owned - wondering if this family running it has done this before or has family who has run one... The product looks good. Gaa...was just about to head there for lunch when I noticed that they're only open on weekdays. *Thank you* for scanning that menu! That's an interesting find! I never thought about fish and chips as anything beyond what Carl's Jr serves, but even fried fish and french fries can sound so appetizing when you review it. I like the fact that it's a fresh fish. Thanks for putting up the link. I've been too busy to do so on the post. You're welcome! Like you, I wish they were open on weekends. Fish that good should be available at all hours. I stumbled across your blog a few weeks ago...love it! Can't stop reading your reviews.. Keep up the great work!! Jon's Fish Market eh? That's one I'll keep on my list for sure. I have to get over my preconceived notion that Dana Point has got nothing else but expensive places like Michael Mina's Stonehill Tavern and The Ritz Carlton. Like Christian, I am noticing that this place closes up earlier than they advertise. It's a for-lunch only thing now. But remember that you can call them if you are going to get there around dinnertime to let them know you are coming. Went to the chippy fish and chips because of this review. NOT GOOD at all. Order 2 pieces with fries. Price was right for Irvine food. Fish was a little fishy. Batter was thick, a little salt would help the fish. If you don't believe me, give it a try yourself. Even Long John Silver's fish is much better. Sorry Elmo. Hmm...this is getting curiouser and curiouser by the minute! You're the second person to comment that the fish was fishy. The first to say that the batter was too thick. I have to go back and see if they're already slipping. That would be a shame. It's too soon for this to falter -- something that was so good a few weeks ago. For the record: Mine lunch was perfect. Impossibly thin batter. Fish that couldn't be fresher if it started thrashing about on my plastic lunch tray. LJS had been my go to fried fish place for a while, but their food made me kind of bogged down afterwards...like I had chased the meal with a cup full of grease. I'm going back to Chippy's tomorrow! Fingers crossed! Has anyone else tried it? And what was your experience? I'm almost thinking of going for lunch today to see if I notice a difference. I did go back for lunch today and everything seemed fine. The fish seemed a tad greasier. I suspect with food places you're bound to get some fluctuations here and there. Got the hush puppies too and those were real good. Came back from lunch. My God! Line was as a dozen people deep. It almost touched the Japanese joint on the other side! They had a Lenten Friday special. Two fish, chips, and a drink for $6.99. I took it, along with some hushpuppies. Fish was thick, clean tasting, perfect. Batter was crispy, and light. No change from before. Best part: They had Sriracha! Hushpuppies were good (not as good as those I've had in Virginia), but crispy, hearty, with little bits of onion in it. They were very efficient with the orders too. Never lost a beat. Not much of a wait after you ordered. Found out new hours. They close at 3:30 PM. I forgot to note that since the fish is cut from actual fillets, I did notice that other customers got thinner cuts than I did (from the tail end rather than the stomach). Perhaps if I got one of those skinnier pieces, it wouldn't be as moist inside. I guess this warrants yet another visit! WOW! $1.49? That's unnnbelievable! This one I gots to try! Through a bumbling of the Blogger code, I accidentally deleted the originals. Likewise! I hope to write about it soon also, but after another restaurant that I visited a week before Pascal...my short term memory of it must be purged before I forget it all! Good fish and chips *AND* cheap steak! Perhaps a Steer Inn surf and turf plate is called for. Me, I'll settle for a) anytime. My "fried-foods" tooth is stronger than my sweet tooth. Thankfully, I've not had urine-smelling fish and chips at Farmer Boys...yet. But I've had varying degrees of success at different Farmer Boys stores -- I guess it depends on who's cooking. One time, at the Chino branch, it was near perfect. But in the Orange branch, my fish was laden with oil and as greasy as a used car salesman. That's another reason I love the place: It knows the slang. And it's not just a chippy, but THE Chippy. And yes, they close at 6:30 PM (not open on weekends either). I provided the menu and linked to it. It's got the hours and the entire roster of what they cook. Take a look by clicking on the hyperlinks I embedded on the The Chippy's address and also in the post itself! I debated going back the next day to get more...but moderation is a virtue. I'm probably going today though...I figure every other day is moderation enough. HAHA! It only took Annie six months to get me to come out of my Elmo hole...AND, though Annie is too nice to tell you, I was STILL 15 minutes late!!! I promise it won't take as long to meet you. How about middle of April? Since you eat and travel and eat, I bet you've had wonderful fish and chips all around the world. The best I've had was in Christchurch, New Zealand (see below). I saw the other place and wished I had the monetary and word budget to try it. Then I thought, I'll just come back and review that next time. I heard they do pork katsu like no one else...had no idea that you can grind your own sesame seeds...that's wild! Thanks for the tip, as always! Now to play along, if anyone reading this is going to Christchurch, New Zealand, you've got to try City Fish & Chips at 265 Manchester St, Christchurch. They make their chips from scratch!!! Must be eaten to be believed. Hushpuppies! How did I miss that? If they served sweet tea, it would almost be a carbon copy of the fish fry joints I've been to and loved in Virginia! And ain't this food court cool?! Franco's is also is still there, by the way. The fish was actually quite thick and big...or big enough for me. I could eat two easily, but one was just right. Weight-wise it was equivalent to three of Jack in the Box's fish fillets. Yup. The price is just right! Any less and I think they'd have to start using frozen fish, and at that point, what's the point? This fish looks yummie. Have you seen crust more golden? The oil must be changed regularly. So glad I work within walking distance of the Chippy, I eat here at least once a week, the fish and chips are amazing, the best I have ever had. I sometimes have the grilled Salmon when I am feeling healthy, I know Salmon at a food court, but it's really good (Not a fan of the other grilled fish they serve). They have a big following for their baby back ribs on Thursday's also, not much of a rib guy myself, although the look good.